Application of Toluene in the Synthesis of Doxylamine Succinate KC. Chaluvaraju1*, MD. Karvekar2 and AR. Ramesha3 1Department of Pharmaceutical Chemistry, Govt. College of Pharmacy, Bengaluru, Karnataka, India. 2Department of Pharmaceutical Chemistry, Krupanidhi College of Pharmacy, Bengaluru, Karnataka, India. 3R&D, R L Fine Chemicals, Bengaluru, Karnataka, India. ABSTRACT In the present study an efficient method for the synthesis of Doxylamine succinate in the presence of toluene is described. The yield and purity of the product prepared by this method has been found to be better in comparison to reported method. 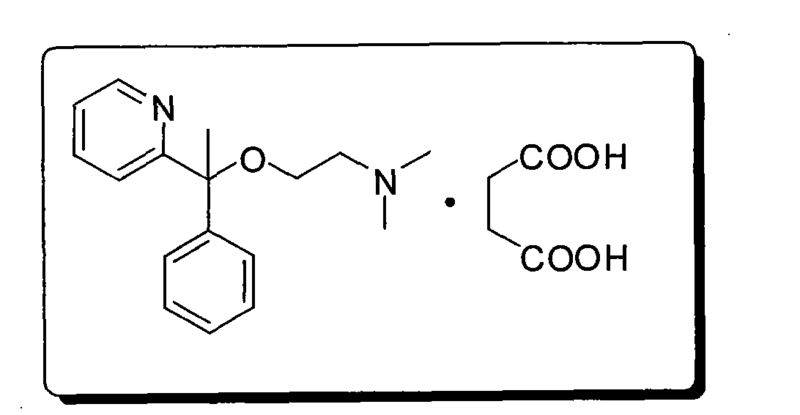 The structure of the synthesized compound was characterised by its melting point and spectral data’s (IR, I HNMR, 13CNMR and Mass spectra). The data obtained are in good agreement with the literature found for Doxylamine succinate. 1HNMR (CDC13) δ ppm: 8.5 (d, J = 2.4 Hz ,1H; Het-H) ,7.6-7.0 (m,8H; Ar-H+ Het-H), 3.5-3.3 (t, J = 6.6 Hz, 2H;-OCH2), 2.6-2.5 (t, J = 3.0 Hz, 2H; – CH2), 2.3-2.2 (s, 6H, -N(CH3)2).2.0-1.9 (s, 3H, -CH3). I3CNMR (CDC13) δ ppm: 148.17, 145.55, 136.17, 127.84, 126.62, 126.21, 121.50, 120.77, 81.81, 61.11, 59.39, 45.91, 23.76. MS (EI) m/z: 271 (M+ ), 257, 226, 182. The present invention aims to provide a class of antihistamines ethanol as doxylamine succinate, the technical problem to be solved is the selection of a new simple synthetic methods. The synthesis of 2-acetyl-pyridine as starting materials, including synthetic and doxylamine salt-forming reaction and the separation and purification process of each unit, wherein the first synthetic doxylamine by The reaction of 2-acetyl pyridine Grignard reagent with bromobenzene and magnesium to produce 2-pyridyl generated methylcarbinol, then 2-pyridyl-methyl-phenyl methanol with sodium amide and sequentially generates 2-dimethylamino ethyl chloride reaction Doxylamine, most 后多西拉敏 a salt with succinic acid to give the title product doxylamine succinate. 150ml three-necked flask of xylene 40ml, weighed 2. 34g (0. 06mol) was added sodium amide three-neck flask, weighed 10g (0.05mol) 2- pyridyl methylcarbinol dissolved in 20ml of xylene was slowly added dropwise, followed by stirring.After the addition was complete, the oil bath was heated 150 ° C, maintained under reflux of xylene, the reaction was refluxed for 5 hours. Color from pale yellow reaction solution gradually turned dark brown, solid gradually dissolved. The dried mixture of 2-dimethylamino ethyl chloride was added 20ml of xylene dropping funnel was slowly added dropwise to the three-necked flask. After the addition was complete, maintaining at reflux for 20 hours. TLC monitoring of the reaction process, the reactants and products change (V petroleum ether: V ethyl acetate = 5: 1). Phase. Drying, filtration, rotary evaporation to remove xylene. The obtained crude product was subjected to silica gel mixed with the sample, the liquid sample with the silica mass ratio of 1: 2, dissolved in ethyl acetate, and stirred for half an hour, the solvent was removed by rotary evaporation. The mixed sample was subjected to column chromatography on silica gel, eluting with a mixed solvent (V petroleum ether: V ethyl acetate = 2: 1) petroleum ether and ethyl acetate eluent until the 2-pyridyl-methyl-phenyl The complete collection of components of methanol to stop the elution. The eluent was collected and the solvent was removed by rotary evaporation, after recycling the recovered 2-pyridyl-methyl-phenyl methanol and dried in vacuo. The chromatography column of silica gel and the eluent was poured into the remaining single-necked flask, and the crude product was added mass of diethylamine, stirred for half an hour, filtration, and the solvent was removed by rotary evaporation and the liquid diethyl amine, to give doxylamine 7. 3g, 54% yield. Gas content was 99%. (Column chamber temperature 250 ° C, detection temperature 300 ° C, vaporization temperature of 300 ° C). 1HNMr (CDCI3), δ: 8 · 51 (1Η, m), 7 · 60-7 61 (2Η, m), 7 · 40 (2Η, m), 7 · 27 (2Η, m),. 7. 18 (1Η, m), 7. 09 (1H, m), 3. 41 (2H, m), 2. 59 (2H, m), 2. 27 (6H, s), 1. 98 (3H , s). Doxylamine 1. 35g (0. 005mol) and succinic 0. 59g (0. 005mol) was added IOml single-necked flask, adding acetone 7ml, heating and stirring until dissolved, stirring was continued for half an hour, the heating was stopped. Cooled to room temperature and then placed in the refrigerator freezer -20 ° C for 24 hours. Filtration, the solid was placed in a vacuum desiccator the residual solvent was distilled off, and dried for 6 hours. The crude product was dissolved by heating continued recrystallized from acetone (Ig doxylamine succinate: 2.5mL acetone). Steps above, doxylamine succinate, and recrystallized to give 1.6g, 82% yield. Mp 101-103 ° C.
1 Bachman, G. Bryant等.Heterogeneous bimolecular reduction. II. Direct acylation of pyridine and its homologs and analogs.《Journal of Organic Chemistry》.1957,第22卷1302-1308. 2 CHARLESH . TILFORD等.Histamine Antagonists. Basically Substituted Pyridine Derivatives.《Journal of the American Chemical Society 》.1948,第70卷4001-4009. Morning street in Bhaktapur, a UNESCO World Heritage Site on the east corner of the Kathmandu Valley, Bagmati, Nepal. Bhaktapur is an ancient Newar town, . By DR ANTHONY MELVIN CRASTO Ph.D in Uncategorized on April 29, 2015 .